Jhansi is one amongst the few historic cities around Bhopal which can certainly make your weekends interesting and memorable. If you love exploring the rich Indian history, then Jhansi is an ideal place for you as you can dive deep down the layers of time into the British era and learn a lot about that period within the boundaries of Jhansi. Nestled in between Pahuj and Betwa rivers in the state of Uttar Pradesh, Jhansi was also known as the gateway to the Bundelkhand region in the past. Being home to one of the greatest freedom fighters, Rani Lakshmibai, it is popular amongst tourists as the city of Rani Lakshmibai. Over a period of time, it has been developed into a fast-growing city with all the modern facilities. Plan a trip from Bhopal to Jhansi this season to witness its ancient beauty spread across its historic buildings and to learn in brief about its glorious past. With an extreme type of climate, Jhansi experiences hot summers and hence, it remains a least-visited historic city by local tourists. However, it is frequented by several history lovers and a few international tourists throughout the year. If you are looking forward to explore the beauty of Jhansi amid a cool and pleasant weather, then the best time to visit is from October until the end of March. By Air: There are no direct flights available to Jhansi and hence, you need take a flight to Gwalior Airport, which is located at a distance of about 97 km from Jhansi. From the airport, you can either hire a taxi or catch a bus to Jhansi. By Rail: Jhansi is well connected to nearby cities and towns by rail and hence, you can get direct trains from Bhopal railway station to Jhansi Junction. By Road: Jhansi is situated 320 km from Bhopal and hence, it can be easily accessed by road. As route 1 will take half an hour lesser, thereby, reaching your destination within 6 hr, it is advisable to go through route 1 if you desire to reach Jhansi within minimum time. On your journey to Jhansi, you can also take a break at Eran and unveil its ancient beauty. Eran is located at a distance of around 150 km from Bhopal and 200 km from Jhansi and is a perfect place to take a break on your historical trip to Jhansi. Eran is an archaeological site which is believed to be have been in existence since the advent of the Common Era. You can find here several buildings dating back to the 5th and the 6th century of the Gupta Empire. Settled on the banks of Bina river, Eran is an ideal destination for history lovers who love discovering the grandeur of ancient India. From broken pillars to boar statues and Hindu temples to several inscriptions, there is a lot to explore here. Once you are within the boundaries of Jhansi, you will be open to several historic sites which are all set to teach you a lot about the British era of India. As it has had been a princely state in the past, you can find numerous places which assuredly showcase the royalty of Jhansi and its rulers. Jhans also played a major role during the struggle for freedom from the British and was one of the prominent sites where the revolt of 1857 took place. Who can forget Rani Lakshmibai and her contribution for the independence of the nation? Well, if you always get fascinated with the ancient legends, then you must visit Jhansi this season. Following are the places which you must explore while in this historic city. Jhansi Fort is the most visited and significant site of Jhansi which no traveller or tourist can afford to miss. 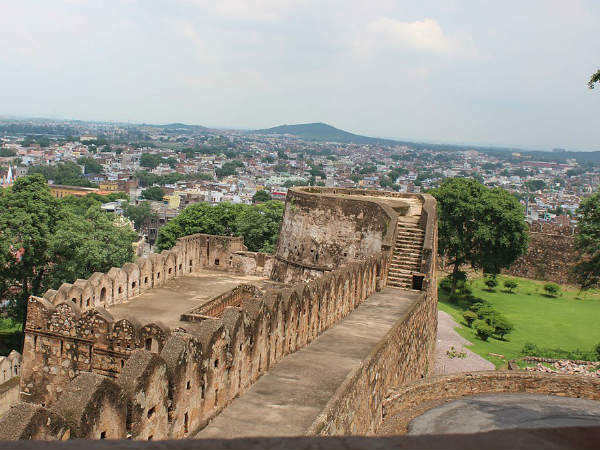 Perched atop a hill, this magnificent fort was the official residence of the kings of the Chandela dynasty until it was conquered by the British after defeating Rani Lakshmibai. Jhansi Fort was one of the strongest and unbreachable forts in North India and the presence of wide walls and tough bastions proves it. How about catching a glimpse of this ancient majesty this season? Your trip to Jhansi is certainly incomplete if you return without witnessing the royal collection of weapons, statues, dresses, paintings and belongings of Rani Lakshmibai, which adorn the walls and slabs of Government Museum. You can also find a few antique pieces from the Gupta dynasty. Government Museum is originally Rani Mahal, which was the royal palace of queen Lakshmibai. Another prime tourist spot which might interest you is St. Jude's Shrine, which is a Roman Catholic sacred place and is visited hundreds of tourists every year. The beautiful architecture of this holy place certainly deserves to be captured on your camera. Besides all these beautiful, majestic and royal places, you can also visit other tourist attractions in Jhansi which include the Tomb of Gangadhar Rao, who was the king of Jhansi and the husband of Rani Lakshmibai, ISKCON Temple, Laxmi Bai Park, Lakshmi Temple, Herbal Garden, Shri Ganesha Mandir and Narayan Bagh.